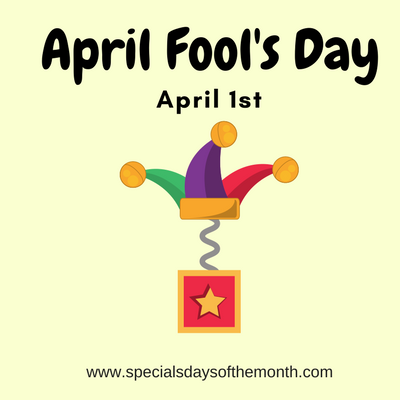 April 1st, frequently referred to as April Fool’s Day is celebrated around the world with a day filled with fun-filled pranks and hopefully laughter. While April 1st is not a federal holiday – when people ask, “What day is today?” the answer is the same throughout the world, April 1st is April Fool’s Day. While well known, it is an unofficial holiday. Fun. How to celebrate April Fool’s Day? Over the past several years, big brands have gotten in on the joke and pulled some funny pranks on their valued customers. Retail clothing store, H&M announced a fashion line by Facebook founder, Mark Zuckerberg. This is especially funny since Zuckerberg is best known for the gray t-shirt and jeans he wears every day. Another great practical joke was the McDonald’s, Micro Mac. A very small version of the Big Mac. They even had a video for the Micro Mac, making it that much more believable. While April Fool’s Day is a holiday for people of all ages, kids seem to love it more than the average adult. One common household trick (not that we are giving you a hint or anything) is using a rubber band to make your kitchen faucet stay on. Another famous trick is the whoopie cushion, that cushion you put on a chair and hope no one sees before they sit down. When they do sit on the cushion a fart sound comes out. A little embarrassment on April 1st seems to go a long way when it comes to the whoopie cushion – especially with children. Looking for some April Fool’s Ideas – Check out these April Fool’s jokes. Some people believe April Fools’ Day is linked to the Spring Equinox, marked on March 20 this year, when mother nature unleashes unpredictable weather on everyone. English pranksters started playing practical jokes on one another on April 1st from at least 1700. If you’re looking for a good trick for April 1st, do a quick search on the internet. Quite a few can be found. What is your favorite April Fool’s Day trick? Other popular holidays in April (besides April Fool’s Day) is National Beer Day, Admin Professionals Day and National Animal Cracker’s Day.